When I schedule the games that I review, I tend to prioritize two things. Variety and timeliness, as I do not want to have two similar reviews back to back, but I also need to take into consideration my schedule, which I have ranted about in detail over the past year or so. This has left me unable to keep my promise of reviewing longer games, as I only get about 15 hours of quality gaming time in a given week, and is largely the reason why I started the whole monthly Ramble segment. That, and I wanted to try performing deeper dives into subjects that I feel strongly about and do not see discussed by people better and smarter than me. On that note, my next review is for Cyberdimension Neptunia, and wouldn’t you know it, a brand new Neptunia game was announced this past week. Developed and published by Idea Factory International Neptunia Shooter is an 8-bit styled shoot ‘em up set to launch exclusively on PC via Steam this summer. While that entire concept is more than a little bizarre, I actually think that Neptunia series is a remarkably good fit for genre-mixing and smaller more experimental projects like this. It is a series about characters based on game consoles and game companies set in video game land, so genre mixing and retro-throwbacks make a lot of sense. Hell, I’m surprised they never made a 16/32-bit style Neptunia JRPG, especially after the idea was explored in the credits of the Re;Birth games. But this still seems like it will warrant a look when it comes out… and not just because it’ll probably be a shorter affair. Though that is not the only Japanese game that catches my eye and is coming to PC within the loosely defined summer months… which is a really weird and truncated way to transition things, but whatever. My point is that Yakuza Kiwami 2 is heading to PC via Steam on May 9th, surprising absolutely nobody after 0 and Kiwami 1 did so well on the platform, while the rule of ratings systems remains true, as Octopath Traveler also coming to PC, with a release date of June 7th. The Yakuza series is one I desperately want to get into, but 100+ hour long games are quite intimidating and difficult to schedule when you sometimes go 3 days a week without having any opportunities to play video games, like this past week. Seriously, I bought Yakuza 0, but haven’t found a spot for it in my entire 2019 schedule. Whereas Octopath is a title that I already purchased during a sale earlier in the year, but now I’m considering selling my Switch copy, which is still in its shrinkwrap, and just buying the PC version instead. If only because I have little doubts that the PC will be the definitive one. Well, I do have some doubts, all of them centering around Square Enix, but I’m sure that people will be able to mod this game to look all sorts of pretty even if the port is a triffle bit rubbish. I would have already sold my Switch copy, but Glyde stopped selling games this past year so I need to find another online storefront that will let me ship my games to interested buyers for a reasonable fee. 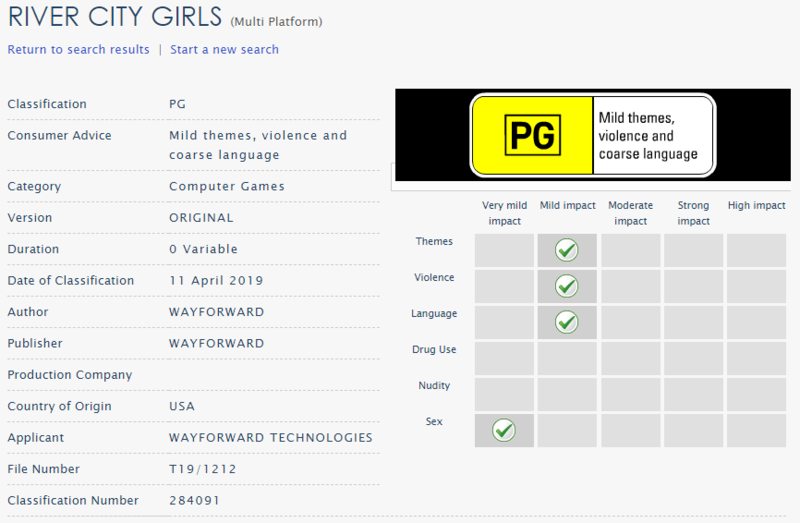 With the subject of games whose existence came to light via a ratings board, the Australian Classification Board basically confirmed the existence of a WayForward developed and published title by the name of River City Girls, which is a topic that warrants its very own storytime section! Back in the early days of the beat ‘em up genre, developer Technos was a fairly prolific name, best known for the Double Dragon and Kunio-kun series of games. The Kunio-kun games were about hot blooded Japanese youths getting into fights and occasionally engaging in some form of exaggerated sports, and since their inception the series has been given a number of different names, the most prolific of which was River City Ransom. So now the series is known as River City in the west, and while modern entries have completely given up on westernizing the titles, a western developer made a sequel to River City Ransom, not the Kunio-kun game it was based on, dubbed River City Ransom: Underground. All of which means that… this game could anything realistically, but I hope it is about sukeban anime girls punching gangsters in the face. Shifting over to something completely different, remember how Final Fantasy XV director Hajime Tabata opened up his own studio, JP Games, after something seemingly went horribly wrong at Square Enix? 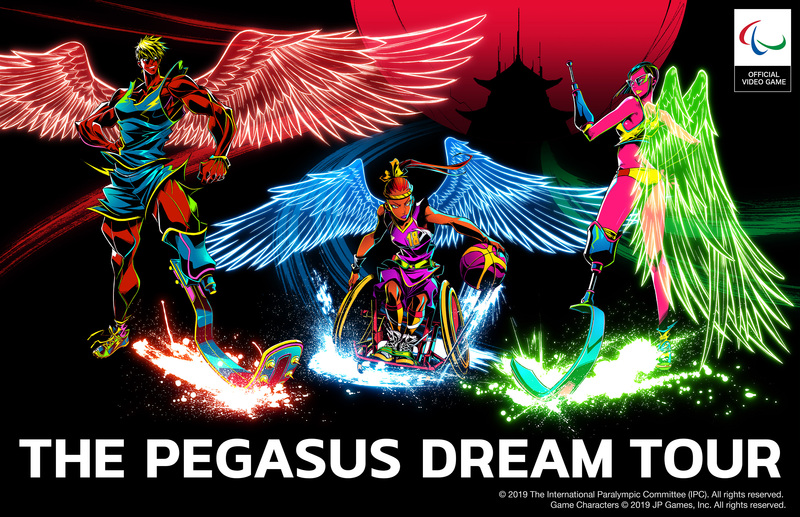 Well, they recently announced The Pegasus Dream Tour, a Paralympics branded sports RPG that seems to involve rad looking ladies with neon angel wings and prosthetic limbs. I have absolutely no idea what this game is meant to be beyond that description, but that idea and the talent behind it are enough to warrant my wrapped attention. Oh, right, and a cinematic trailer for the latest Star Wars game from EA and Respawn Entertainment, Star Wars Jedi: Fallen Order was revealed… and it honestly looks about as safe as can be. What with the title following a Jedi who went into hiding during that beloved few decades between Episodes III and IV, where it will follow the milquetoast looking protagonist and his ragtag group of allies as they stick it to the man in whatever way thee see fit. I honestly have a very loose attachment to this series (I have not watched any of the films in a good decade, let alone the new trilogy) but even if I were I would want this new project to seem like it adds to the universe, rather than the somewhat derivative picture painted by this trailer. Regardless, the game will be out on November 15th for PS4, XBO, and PC. 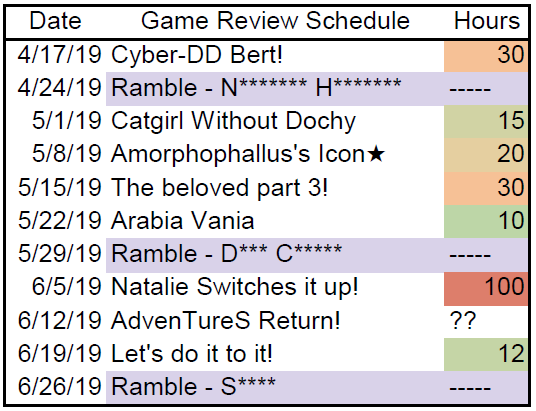 The header image this week depicts my tentative Wednesday schedule from now until June, but I changed the names around to inane references that I doubt anybody will get, because making inane references brings me an immense amount of joy. This entry was posted in Rundown and tagged Hyperdimension Neptunia, JP Games, Octopath Traveler, River City Girls, The Pegasus Dream Tour, Yakuza by Natalie Neumann. Bookmark the permalink.